The peacock design over the fireplace in the Durbar Room. 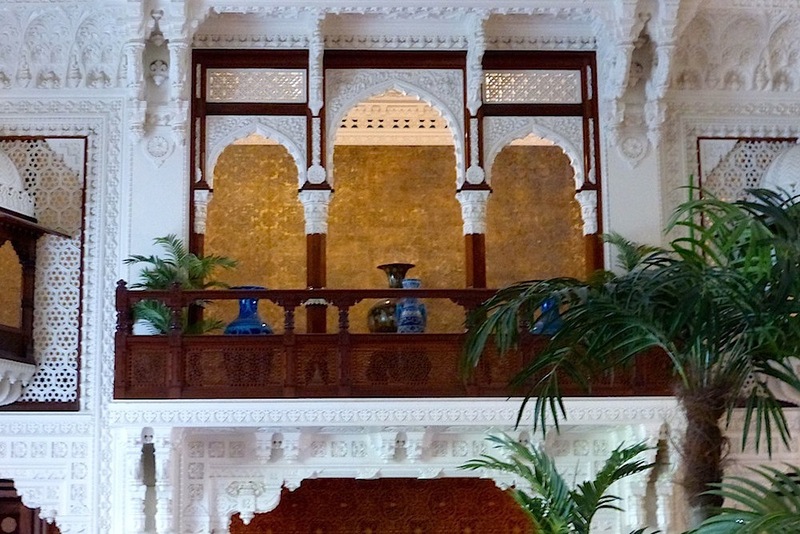 The Durbar Wing of Osborne, completed in 1891, is the most exotic, not to say astonishing, part of this Grade I listed building at East Cowes. If anything, it was even more collaborative than the rest of Osborne. Although Thomas Cubitt had died in 1855, Prince Albert in 1861, and the Queen's artistic adviser, Ludwig Grüner in 1882, there were still several parties involved. The general plan was devised by John Randall Mann (1828-1918), who had trained at Cubitt's, and had been Surveyor of Works at Osborne since 1857 (Turner 3). 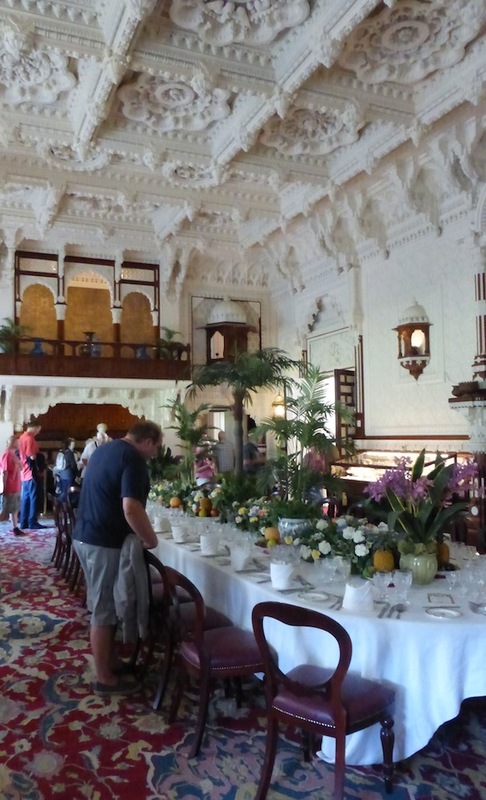 The Queen and Princess Louise both took a keen interest in the interior design of its great hall, which was supervised in general by John Lockwood Kipling (1837-1911) and carried out in detail and on the spot by Bhai Ram Singh (1858-1916), the Sikh architect who had been trained by him and was his assistant master at the Mayo School of Art in Lahore, of which Kipling was Principal. 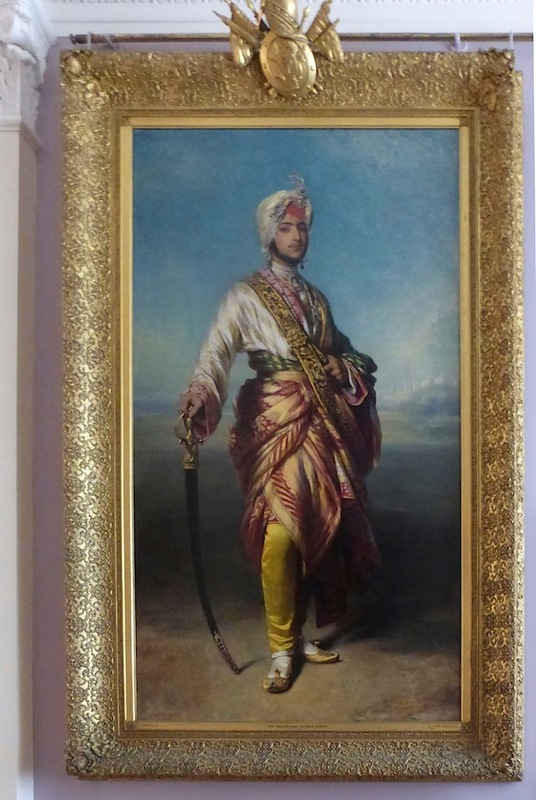 Left to right: (a) Full-length portrait of the Queen's teenage favourite, Maharajah Duleep Singh, painted by Franz Winterhalter in 1854. 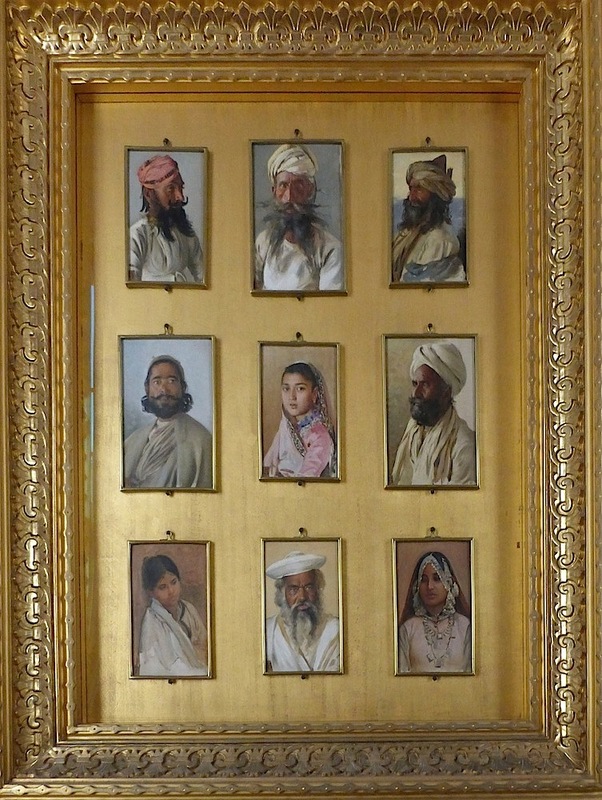 (b) One of the Queen's framed collections of portraits of Indians from various parts of the subcontinent by Rudolf Swoboda, painted in 1886-88. 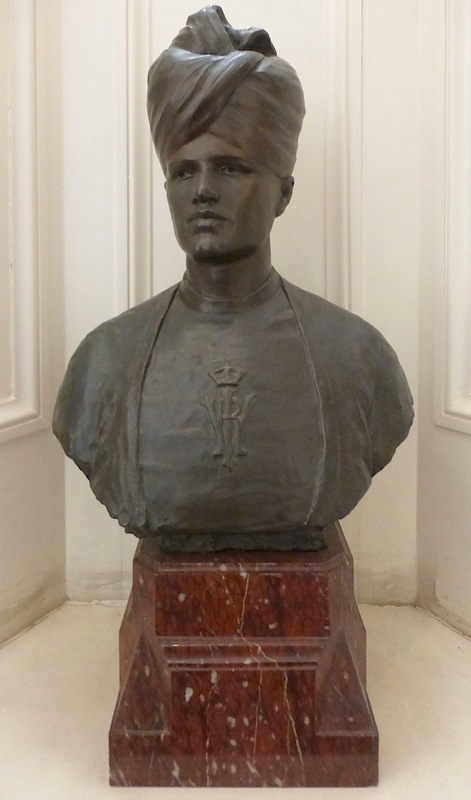 (c) A small bronze bust of one of Queen Victoria's Indian servants, Mohammed Ismail. He wears a turban and wears his livery with its crowned royal emblem on the chest. The wing was built to house Queen Victoria's youngest daughter, Princess Beatrice, and her husband, Prince Henry of Battenberg on the upper floor, and also to provide a taste of the great subcontinent of which Queen Victoria was styled Empress, but which she would never visit. Like the Grand Corridor in the Main Wing, the Durbar Corridor is handsomely decorated and more like an art gallery than a passageway. But in this case, its display is of Indian portraiture, both in paint and sculpture — a fitting preparation for the Durbar Hall itself. Favourites, servants and a sampling of the Queen's subject peoples are all show here, making a "unique and extensive collection" of work by Rudolf Swoboda (1859-1914) in particular (Turner 23). Left to right: (a) A general view of the room, looking towards the entrance from the Durbar corridor. (b) A close-up of the Moorish version of a minstrels' gallery, but with its Moorish arches. (c) The room looking towards this gallery. Here, as Julius Bryant writes: "The mixture of Mughal and Hindu decor is layered over a very British baronial hall" (461): the effect, especially after first coming in from outside, is overwhelming. 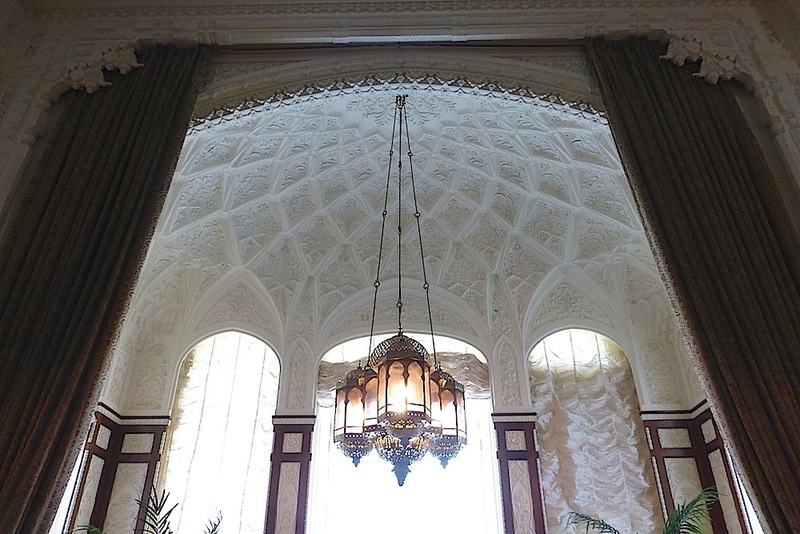 The coffered ceiling seems encrusted with patterns in deep relief — "rounded pendants and large flower-shaped panels over-laid with dove-like figures," while the upper walls too are "faced with intricate decoration in plaster and carton pierre (a form of papier mâché)" (Lloyd and Pevsner 209). The relief panels below that are of plaster, framed with teak, making a rich contrast. The whole effect is overwhelming. 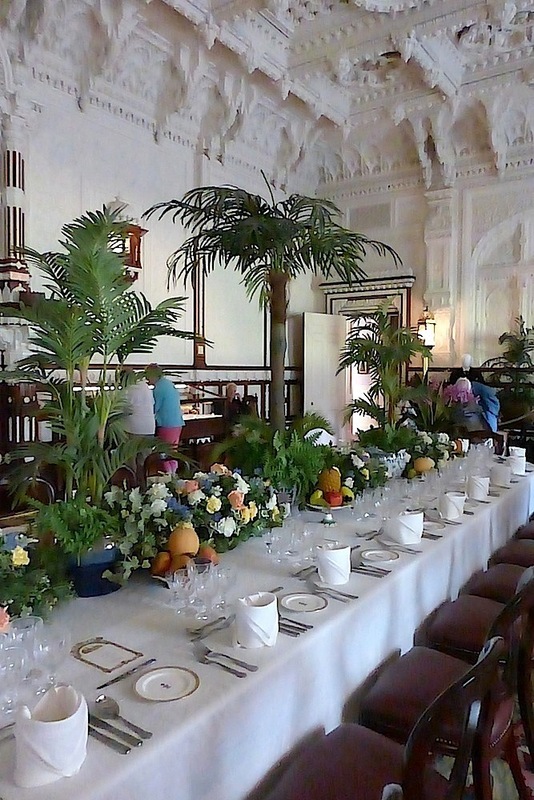 It makes a fabulous banqueting room. 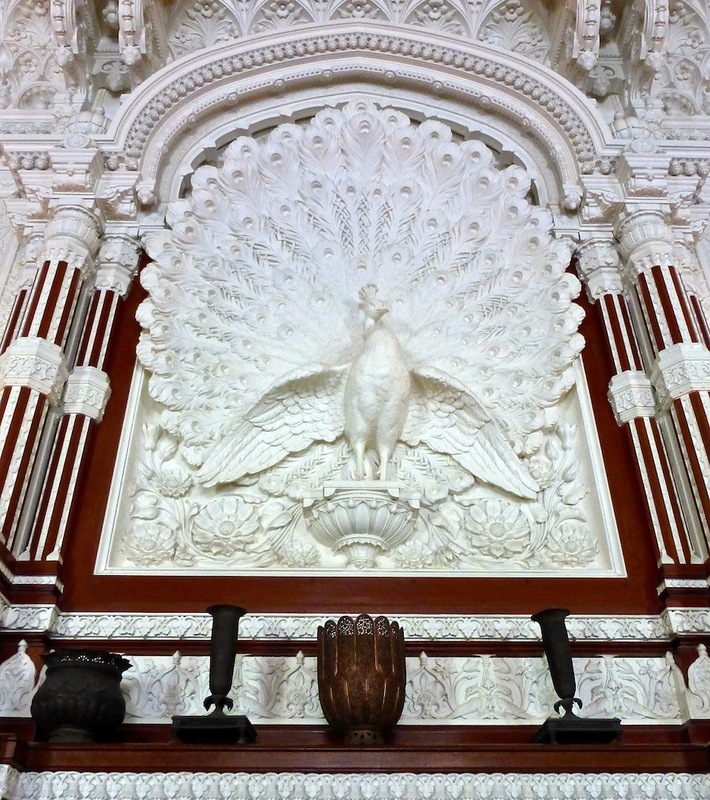 Left to right: (a) Another view of the peacock design over the fireplace, with a shelf beneath. 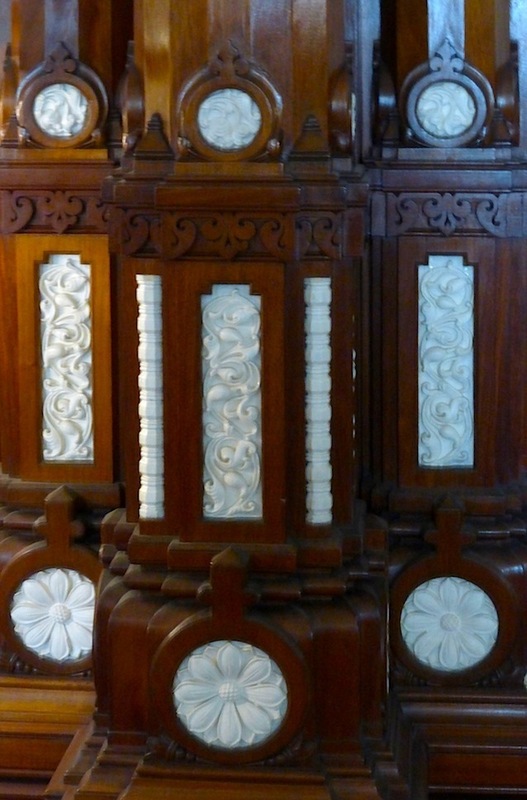 (b) Clustered columns of teak inset with plaster rosettes at each side of the fireplace. (c) Fine metalwork above the firebasket. 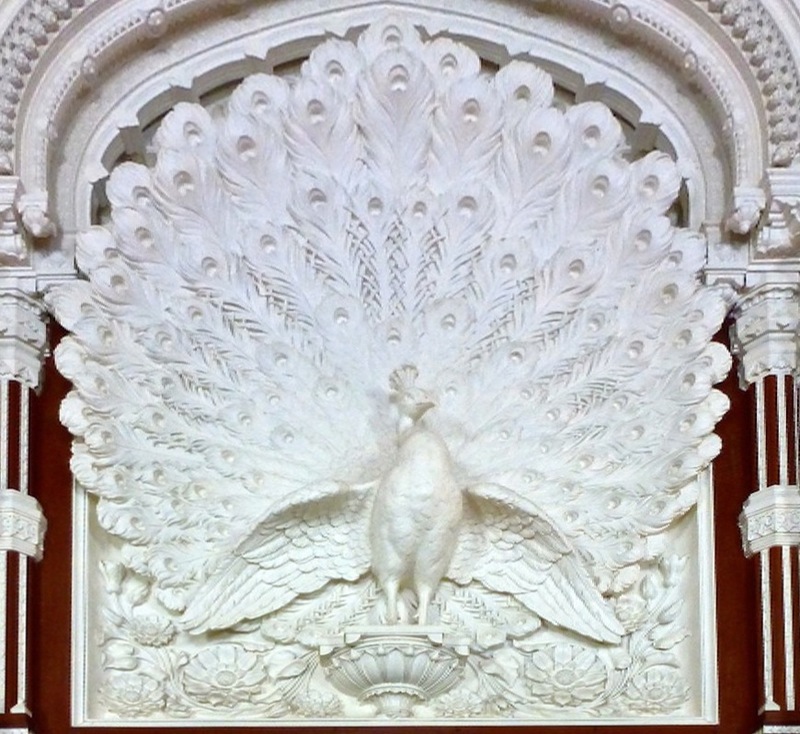 The peacock design for the overmantel was Princess Louise's idea. It was an extremely labour-intensive project, and is still the most celebrated element of the room: for instance, it features on the front cover of John Lockwood Kipling: Arts and Crafts in the Punjab and London (see bibliography). But every single element here, including andirons, doorhandles and so on, is richly and intricately detailed. 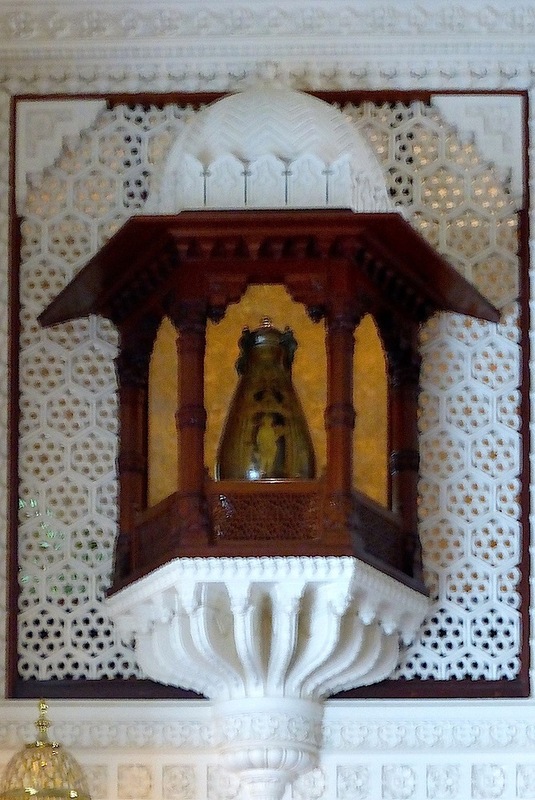 Left to right: (a) A lamp hanging in a domed window recess. (b) A canopied wall-fitment, also for lighting. (c) An overdoor panel featuring, centrally, Ganesha, the Hindu elephant-god, who represents wisdom, understanding, clear judgement, the ability to tackle and overcome all obstacles, and associated qualities. It is astonishing to find a Hindu god here, on the door beside the gallery, when missionaries were engaged in efforts to convert Indians to Christianity. 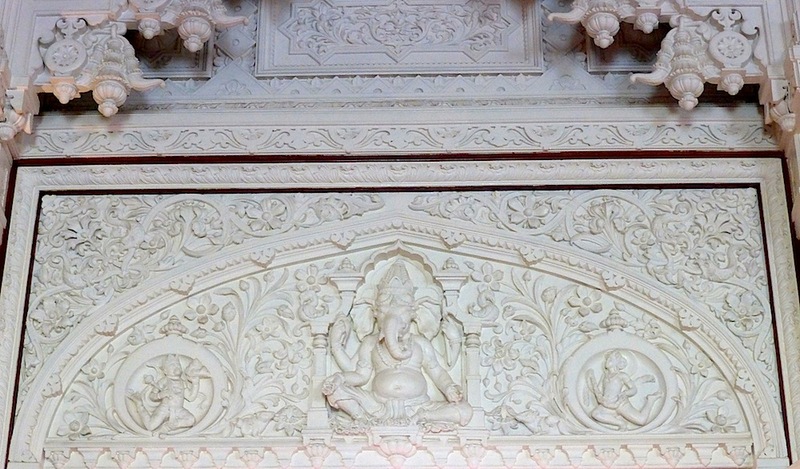 But Ganesha is highly auspicious and it certainly adds to the authenticity of the room. Traditionally, food is spread in front of the god and a rat sits beside his foot (see on the right), looking up as if for permission to join in the feast: this is said to represent the control of desire. Every detail has its meaning. For example, the axe in one of the god's four hands represents the more drastic curbing of desire. Bryant, Julius, and Susan Weber, eds. John Lockwood Kipling: Arts and Crafts in the Punjab and London. New York: Bard Graduate Centre Gallery; New Haven and London: Yale University Press, 2017. "History of Osborne." English Heritage. Web. 10 September 2017 (this site has an excellent plan of the whole house). Parthasarathy, A. The Symbolism of Hindu Gods and Rituals. 4th ed. Bombay: Vedanta Life Institute, 1994. "Mohammed Ismail." Royal Collection. Web. 13 September 2017.